Each chapter includes an all-new "big ideas" case study in policy analysis to stimulate student interest in timely and important problems. The dedicated chapter on evidence-based policy and the role of field experiments has been thoroughly rewritten and expanded. New sections on important developments in the field have been added, including using scientific evidence in public policymaking, systematic reviews, meta-analyses, and "big data." Data sets to apply analytical techniques are included online as IBM SPSS 23.0 files and are convertible to Excel, Stata, and R statistical software programs to suit a variety of course needs and teaching styles. All-new PowerPoint slides are included to make instructor preparation easier than ever before. 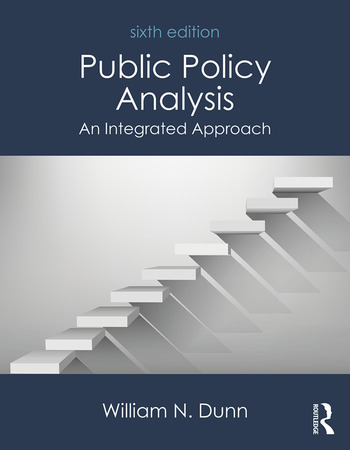 Designed to prepare students from a variety of academic backgrounds to conduct policy analysis on their own, without requiring a background in microeconomics, Public Policy Analysis, Sixth Edition helps students develop the practical skills needed to communicate findings through memos, position papers, and other forms of structured analytical writing. The text engages students by challenging them to critically analyze the arguments of policy practitioners as well as political scientists, economists, and political philosophers. William N. Dunn is Professor in the Graduate School of Public and International Affairs at the University of Pittsburgh, USA.